Affordable In-Home LASIK Surgery You Can Do Yourself! In the past, LASIK surgery was an expensive procedure that could only be performed by skilled professionals in a doctor's office or eye clinic. Often costing upwards of $1000 per eye and almost never covered by insurance, Laser-Assisted In Situ Keratomileusis (LASIK) was beyond the reach of most Americans. Now the revolutionary LASIK@Home system makes clear vision affordable for everyone. LASIK@Home is the same patented surgical procedure performed at eye clinics around the world, but without the unnecessary equipment and staff. Find out more on the How It Works page. LASIK@Home was founded in 2004 by Dr. Amir Khadim, M.D., Ph.D. A pioneer in the field of LASIK surgery, Dr. Khadim performed more than two thousand LASIK procedures at the prestigious Bennett Eye Care Institute in New York City before leaving to develop LASIK@Home. He has received awards for excellence from both the Optical Surgeons of America (OSOA) and the Manhattan Ophthalmologists Association (MOA). LASIK@Home is committed to bringing clear vision to those less fortunate. We encourage you to donate your old eyeglasses to your local school, Lions Club, or other charity. 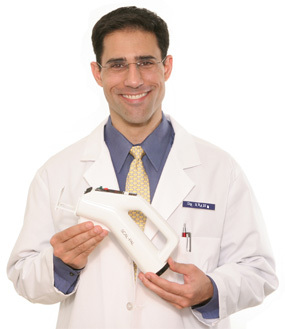 Dr. Amir Khadim, M.D., Ph.D.